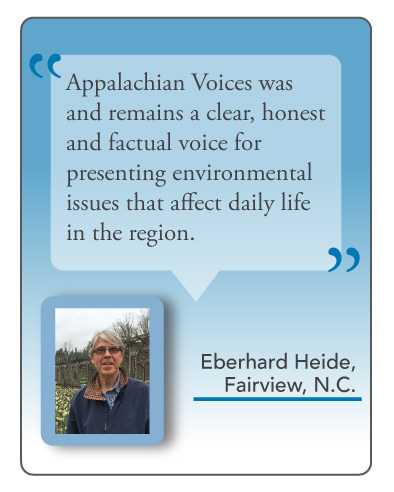 Working as lead editorial assistant for our bimonthly publication, The Appalachian Voice, this internship will focus on journalistic writing including conducting interviews, researching stories, writing articles, reformatting press releases and assisting with other aspects of print production including copy-editing, production, photo managing and distribution. The assistant may also write news articles for our Front Porch Blog and monthly e-newsletter, The Advocate, as well as help manage our calendar of events and other communication needs of the organization. This position will require the assistant to keep up to date with environmental news and current events, and write regularly about these topics as they pertain to the Appalachian region and the work of Appalachian Voices. Subjects of focus include topics that parallel the organization’s primary programmatic work, such as the impacts of coal and natural gas, air and water pollution, and clean energy, as well as other topics such as forestry and land stewardship, Appalachian history and culture, and outdoor recreation. This position will be located in our Boone, N.C. main office.